The Alaskan Malamute hails from the Arctic region, where it depended on its thick coat to survive the extreme cold. 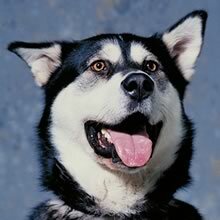 It was first recorded living among the Mahlemuts in Alaska (Malamute means “village of the Mahle”). The Alaskan Malamutes were bred for size and power to assist in hauling the bodies of seals and polar bears back to the village. They performed an essential function and became valued workers and companions. The Alaskan Malamute was endangered by interbreeding during the Alaskan gold rush of 1896, but was rescued by a breeder and Alaskan Malamute enthusiast in New England in the 1920’s, and thereafter increased in popularity. Alaskan Malamutes achieved fame by assisting in Admiral Byrd’s trek to the South Pole in 1933 and served as pack dogs and search-and-rescue dogs in World War II. They are the prototypical strong, unrelenting sled dog. Alaskan Malamutes have a shoulder height of 58-63.5 cm (23-25 in) and weighs 34-38.5 kg (75-85 lbs). With broad heads and heavy bones, they are built for pulling weight. Alaskan Malamutes have large muzzles, brown, almond shaped eyes, and triangular, rounded ears. They have straight backs and large feet, with plumed tails which curl over the back. “Giant” Malamutes which weigh over 140 lbs are sometimes bred, but not as show dogs. Alaskan Malamutes are slightly longer than they are tall. The Alaskan Malamute has a dense double coat. The outer coat is thick and coarse and the under coat is greasy and wooly. The coat is either pure white or a mixture of white with grey, sable, black, or red, with white legs and muzzle. Alaskan Malamutes grow their coat in winter and shed in spring. The Alaskan Malamute is friendly, affectionate, and loyal, but can have a mind of its own. They are energetic like puppies for many years, but mellow out in older age. Alaskan Malamutes bond very closely with their master. They don’t mind living outdoors as long as sufficient human companionship is available. Alaskan Malamutes are generally quiet, but may howl, and are fond of digging. The Alaskan Malamute is friendly, affectionate, and loyal, but can have a mind of its own. They are energetic like puppies for many years, but mellow out in older age. Alaskan Malamutes bond very closely with their master. They don’t mind living outdoors as long as sufficient human companionship is available. Alaskan Malamutes are generally quiet, but may howl, and are fond of digging. Alaskan Malamutes generally get along well with children, especially older children. Their friendliness makes them somewhat unsuitable as watchdogs. The Alaskan Malamute should be watched around smaller breeds or other pets due to a strong prey instinct. They may be aggressive towards other Alaskan Malamutes of the same gender. Early socialization is important to help the Alaskan Malamute get along with other pets. You can find Alaskan Malamute puppies priced from $150 USD to $3000 USD with one of our credible breeders. Browse through our breeder's listings and find your perfect puppy at the perfect price. Alaskan Malamutes generally get along well with children, especially older children. Their friendliness makes them somewhat unsuitable as watchdogs. The Alaskan Malamute should be watched around smaller breeds or other pets due to a strong prey instinct. They may be aggressive towards other Alaskan Malamutes of the same gender. Early socialization is important to help the Alaskan Malamute get along with other pets. The Alaskan Malamute does not require frequent grooming, but a good comb-out with a coarse comb is required when shedding. Alaskan Malamutes have litters of 4-10 and a life span of 10-12 years. They are susceptible to musculoskeletal and dermatological diseases. They are generally unsuited to hot climates, and should be given plenty of shade, water, and cooling when living in warm areas. Alaskan Malamutes will eat whatever they are fed, so avoid overfeeding to prevent obesity. Although they are friendly and well mannered, Alaskan Malamutes need a firm approach in their training to achieve obedience. Some Alaskan Malamutes may be difficult to housebreak. The Alaskan Malamute needs a lot of exercise. At least one hour a day of hard exercise is advisable. Alaskan Malamutes absolutely love to pull a sled or wagon, but also enjoy running and roaming. Alaskan Malamutes can become depressed and aggressive if not allowed to exercise. Alaskan Malamute Puppies for Sale - Shipped Worldwide! Finding the right Alaskan Malamute puppy can be dog gone hard work. PuppyFind® provides a convenient and efficient means of selecting and purchasing the perfect Alaskan Malamute puppy (or Alaskan Malamute puppies) from the comfort of your home, 24 hours a day, 7 days a week. Take advantage of our PuppySearch or leisurely browse our directory of hundreds of dog breeds, Alaskan Malamute dog breeders, Alaskan Malamute dogs for adoption, and Alaskan Malamute puppy for sale listings with photos and detailed descriptions. Some Alaskan Malamute puppies for sale may be shipped Worldwide and include crate and veterinarian checkup. Many Alaskan Malamute dog breeders with puppies for sale also offer a health guarantee. With thousands of Alaskan Malamute puppies for sale and hundreds of Alaskan Malamute dog breeders, you're sure to find the perfect Alaskan Malamute puppy.